There’s an extra treat for rally fans at FoS this year. 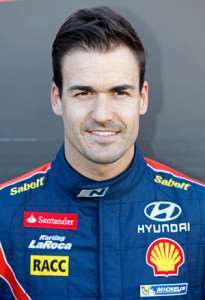 Spanish rally star Dani Sordo will be driving his Hyundai i20 against the clock on the FoS ‘special stage’, as well as demonstrating its prowess on the Hillclimb. It’s the first time the i20 will have been seen in the UK, but the car is already making a mark on the world rally stage – Dani drove it to a maiden podium finish on Rally Mexico, which was only the car’s third event. He’s a perfect fit for our ‘addicted to winning’ them too, scoring a maiden WRC victory on Rallye Deutschland last year, and having taken 36 World Championship podium finishes during his career and the Junior World Rally Championship title in 2005. In case you haven’t noticed our earlier announcements, it’s the first time the FoS rally stage will be run against the clock. The scene is set for a spectacular competition as Dani’s rivals during the Festival of Speed weekend will include former World Rally champions Sebastien Loeb and Bjorn Waldegard…. We can’t wait! Tickets for all the Goodwood events are available here.